Free calls and internet for the Ambassadors of Progress 2015! As last year, for the Ambassadors of Progress that will attend the 2015 edition of Miss Progress International, a useful gift from TRE to stay in touch with home. The telephone mobile company Tre, through one of its official dealer, Mignini Srl of Taranto, as a sponsor will give FOR FREE to each contestant a USIM with 10 EUR of pre-charged credit and 1GB of free internet connection. On each USIM will be activated “All In International”, a very special package to call the country of origin. 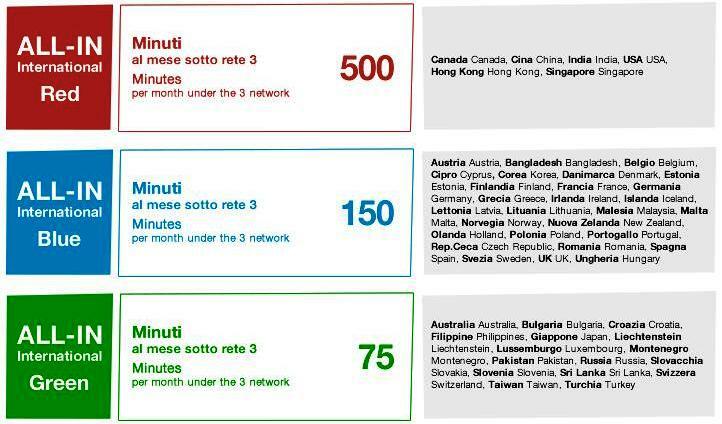 The amounts of free calls are different according to the following table. Unfortunately not all of the countries that will be represented have a special rate, but with those 10 EUR each delegate will be able to make at least a couple of long distance calls for free during her stay.